The physical games market may be in decline, but it remains a hugely lucrative area that's worth billions of dollars worldwide. 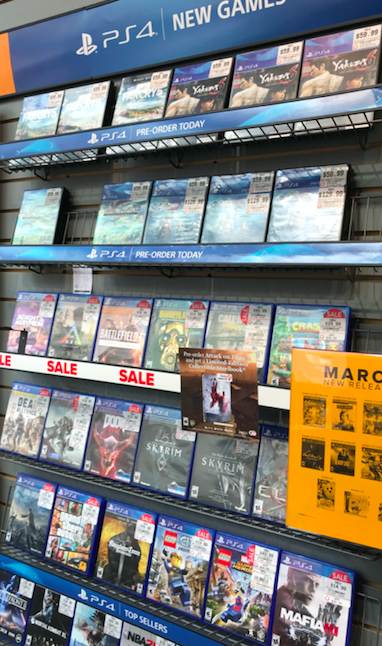 Indeed, when it comes to AAA launches, an estimated 75% of an average game's sale still comes via physical goods sold via Amazon, GAME, GameStop and the rest. We teamed up with ISFE and Ipsos Mori's GameTrack consumer survey to ask buyers of physical games why they choose boxes over downloads. For buyers across Spain, UK, France and Germany, the main reason for gamers acquiring physical items is because they simply like having a boxed collection. Out of the 3,090 boxed game buyers surveyed (representing 15.3 million people), 32% said that owning a collection is why they chose physical over digital. The second most popular answer is due to price. 18% of respondents say they bought a physical item because it was discounted in store, while 13% said it costs less money to buy games physically. Another big reason for owning physical is the ability to lend a game, sell a game or gift a game to other people. 17% said they buy physical so they can play the game in different locations or lend to a friend/family member, while 13% said they want the ability to give the game to someone else. 12% said they like the ability to sell the game when they are finished. In terms of technical limitations, 7% say they chose physical due to poor internet speed, 5% because their internet access it limited and 10% said it was due to the amount of memory a game eats up on their hard-drive. Interestingly, issues around needing a credit or debit card for online retail - a popular reason cited by High Street retailers as to why physical games are still important - came lowest in the survey. Just 3% said their decision to buy boxed games was due to the lack of a credit card or PayPal account, 4% said they don't like inputing personal information online, while a further 5% said they didn't trust online retailers with their details. Other reasons for choosing physical included the appeal of special and collector's editions (6%), proximity to the shops (9%) and not finding the game to download (6%). Why do gamers buy digital? In addition to this survey, GameTrack also asked UK, French, German and Spanish gamers who download titles why they do that over buying physical. The most popular reason for download was price. 30% said it as cheaper to buy digitally than physically, while 20% said they bought digitally because of discounting. 16% of respondents said they liked downloading because it means they could have all of their games wherever they go. 15% said they buy digital because the games they bought weren't available physically - which suggests that maybe they would have bought a physical version if it were available. 15% also said they bought digitally because they wanted to play the game immediately as they saw it on Xbox Live/PSN/Steam, and a further 11% said it is because they don't want to leave their home. Another 7% said they buy digital as there are no shops near where they live, while 7% also said they like to pre-order and play the game the moment it is released. Another reason cited by 10% of respondents is that physical games simply take up too much space. Other reason include having a code/online voucher to use (9% of respondents) and wanting to access the season pass and other online extras (6%). Overall, 23% of respondents say they now prefer to buy full game downloads rather than physical discs or cartridges. For more information on Ipsos Mori's GameTrack service, click here. I am old fashioned, I like to have my personal best games in physical form. My ratio is 90% digital / 10% physical. It is about the Love. I am surprised no one mentioned "the fear of not being able to play my game later on when the virtual shop closes down"
I like to know that I actually own my games as digital licenses are truly not "yours" what so ever... Digital is convenient for the games I get for a.subscription I have through whatever service they give games through. As they're technically not really mine anyways as long as I pay for my subscriptions they stay available. I assume that the answers are very different between PC and console. For consoles games are often indeed cheaper in physical form, even in the long run. On the PC, unless you pre-order or have to play everything at release, sales make digital much cheaper. Availability also is different, with PC having a lot more games on digital (and physical are typically only game codes anyway), while consoles still don't have every physical game on digital. Without breaking the survey into PC and console users it would be hard to make real sense of the figures. In PC I am fine with digital (and even if I wouldn't, It's hard to find PC physical packages O_ò) But in Playstation, I prefer physical or nothing. I had troubles with the store, fortunately I lost quite few things but since then, I don't trust on it. Well... in my case is because after 6-10 months I can find that game already discounted for 35€ in amazon, while in PSN store is still 69€. Agreed. The value of these responses is marred by the lack of division between PC and console games. This is very obvious when a more or less equal number of respondents say digital and physical are cheaper than each other. The PC physical market is more or less dead, but consoles are going pretty strong. As far as the question goes, I like having a collection of games that I 100% own, and isn't dependent on how long servers stay up. Boxed games really need to have more value as collectibles, though - bring back proper manuals and inserts! Thanks for these results! Can we see the results with only console customers included? The only place physical sales still matter is console, so including PC is likely skewing the percentages.